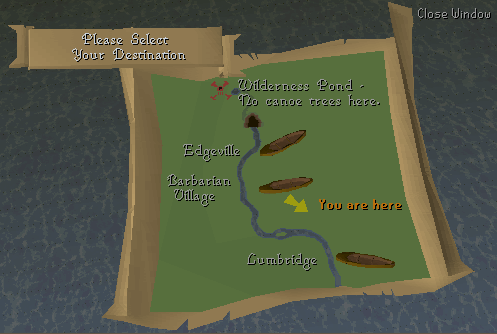 Canoes are the new method of transportation in RuneScape, introduced on the 7th of March, 2006, and they let you row all the way along the River Lum, and even into an underground river which leads to the deep Wilderness. 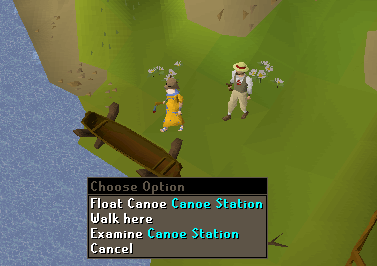 You need at least 12 woodcutting levels to make canoes out of canoe trees. 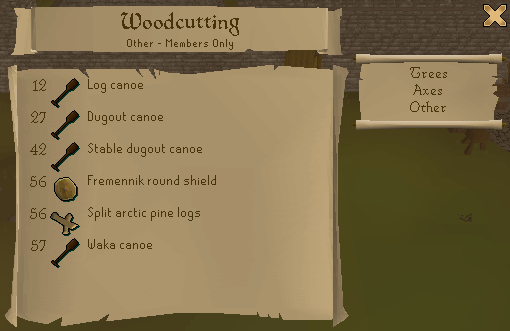 As said before, you'll need to have at least level 12 Woodcutting to make a Canoe. There are 4 different kinds that you can make, each being able to get you further than the others. For a map of the locations on the River Lum, see the map. See the appropriate section for the maps and details. 2. Chop a Canoe Tree. You'll need any type of hatchet for that. 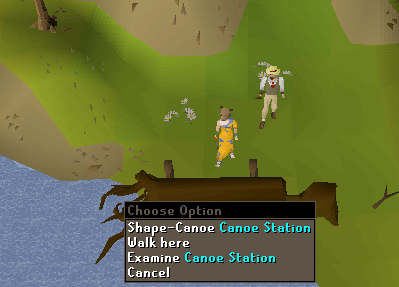 The canoe tree will be always available (as it's usable by every player separately, no one will steal your tree). 3. Let your character carve the canoe tree in the form of your choosing, see below for details about the four types of canoes. 5. Choose the destination. If you chose to carve a Waka canoe, you can go to the Wilderness, but it's a one way trip only! Beware! Choose the "paddle" option, and you'll be soon rowing your canoe! This canoe is made out of a simple log, and needs 12 woodcutting to be made. 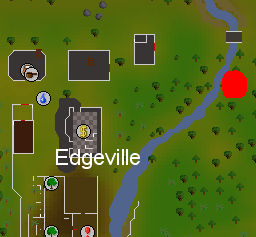 This canoe cannot sustain long trips, and will allow only to go to the nearest available station (if you were in Barbarian Village, you could only go to the Champions' Guild or to Edgeville.). This canoe is a bit more advanced than the former,and it needs 27 woodcutting to be carved out of the canoe tree. This canoe can sustain mildly long trips, allowing you to go to a distance of two stations from your current location. This canoe is a good upgrade to the dugout canoe, and requires 42 woodcutting. This canoe can go everywhere between the four canoe stations. This is the best canoe you can make. It requires 57 woodcutting, and it can go everywhere, plus it allows you to take the underground river that leads to the Wilderness! Note: All stations are on the east side of the river Lum. Ah, Lumbridge. Home of a great castle, a canoe station, and lost and clueless people galore. 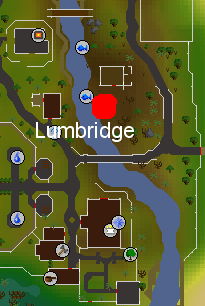 The Lumbridge canoe station is situated just near the fishing spots on the river Lum, south of the goblin-infested house. 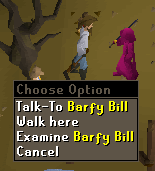 Barfy Bill will be there to help you. The Champions' Guild! 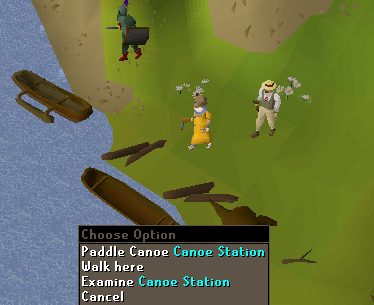 It's the most convenient canoe station for those looking to go to Varrock. 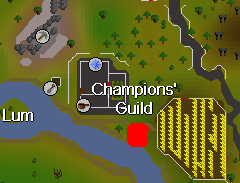 The Champions' Guild canoe station is situated just south of the Guild itself. Access to the station is not restricted, meaning that you can use it even if you're not into the Champions Guild. The canoe helper is Tarquin. 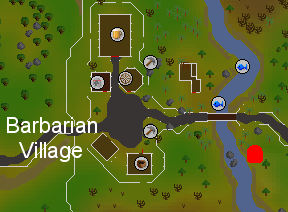 Barbarian Village, home of Barbarians, situated midway between Falador (east) and Varrock (west). Just south of the bridge on the river Lum lies the canoe station, on the eastern side of the river. Sigurd will help you there. Right on the edge of the Wilderness, this is the nearest station to a bank and to the place where the real fighting takes place. Northeast of the town, just south of the little stone bridge over the Lum, there is the northernmost canoe station. 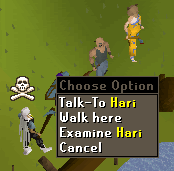 Call Hari if you get stuck. 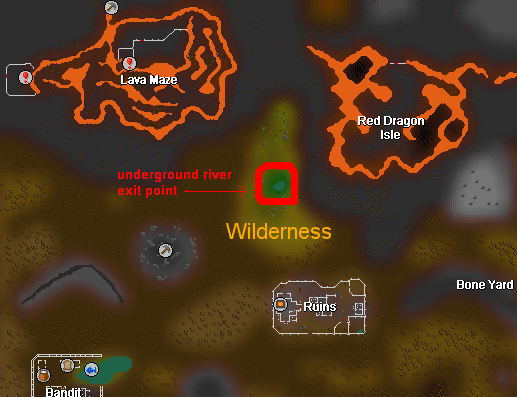 A quick way to get to the deep Wilderness, but be aware of pkers! There is no canoe station here, it's a one-way-only trip! So be sure to know you're going into the wildy before you build a waka and take the underground river! 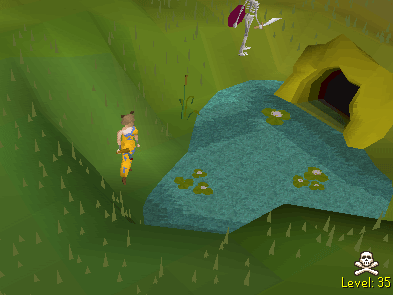 You appear in level 35 wilderness, just south of the moss giants and north of the Ruins (where all the spiders are).